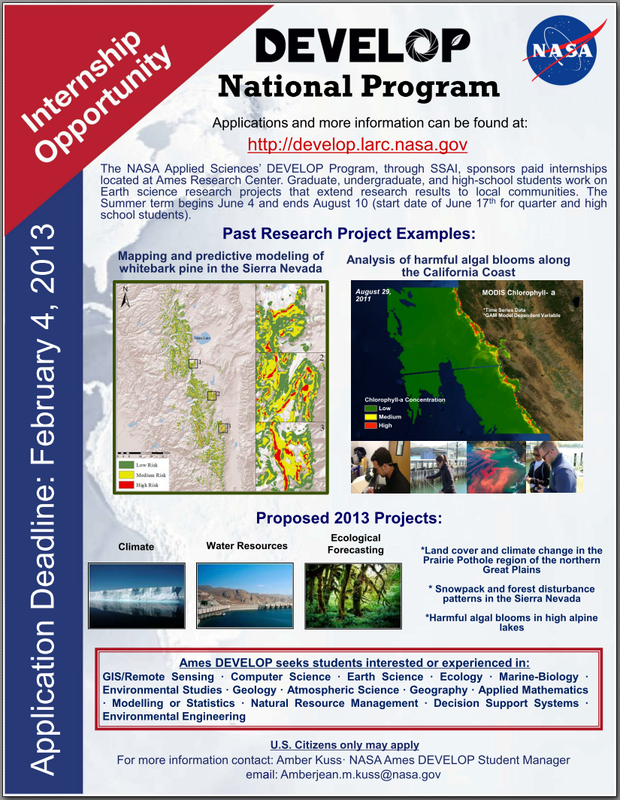 December 2012 | GIS and Remote Sensing Tools, Tips and more ..
NASA announced NASA’s DEVELOP Summer 2013 Internship Program for undergraduate and graduate students with an interest in Geographic Information Systems (GIS) or Remote Sensing. This is a paid 10-week internship program located at NASA Ames Research Center in Mountain View, California that begins June 3, 2012 (for semester system) or June 17 (for quarter system). Student teams research NASA science capabilities relevant to community concerns, create and complete projects using remote sensing and GIS techniques, and create advanced computer generated visualizations demonstrating research results. The activities are student-led, with mentors from NASA and partner organizations. Students of all majors are welcome to apply! Please see the attached flyer. A stipend will be provided for selected students. Student housing options are also available on-site. Attached is a flyer to post in your department. Please feel free to forward this email to any other department or people you think might be interested. 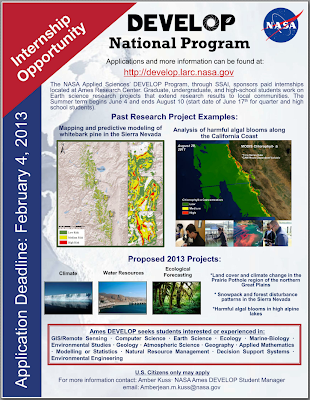 Applications must be postmarked by Monday February 4th, 2013. Interviews will be conducted after applications are received. Students selected for a summer 2013 DEVELOP internship will be notified by late April. 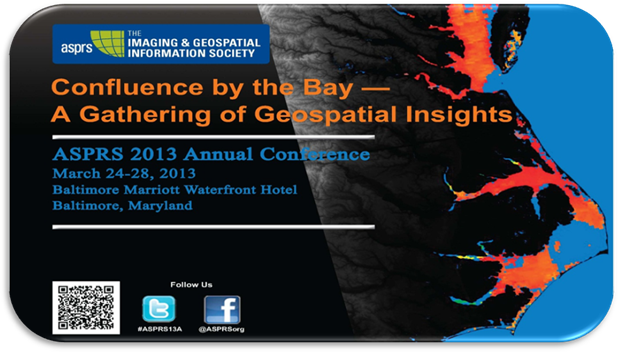 The ASPRS 2013 Annual Conference is coming soon. Start making your plans to attend today! Year 2013 promises to be an encouraging period due to the successful launch (fingers crossed!) of the LDCM Earth observing satellite (January 2013). 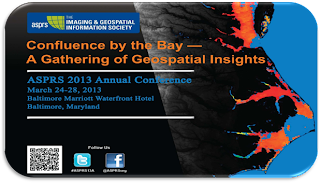 We anticipate first look imagery from Landsat 8 will be presented at our conference! Start making plans to attend today. *Workshops and the Classified Session are not included in the general registration fee. Special student pricing available for workshops. ASPRS reserves the right to cancel any workshop if the minimum number of registrations is not received. Click here to view the registration fees. Presentation abstracts must be submitted by January 8, 2013. Notification of abstract acceptance will be given by February 1, 2013. The meeting will attract educators and practitioners in the fields of ecology, biology, geography, geology, and landscape preservation and design dedicated to preserving and protecting our natural resources. Highlights will include workshops, plenary sessions, symposia, field trips, oral presentations and posters. Austin and the Central Texas area are uniquely situated at the intersection of the Blackland Prairies, Cross Timbers and Edwards Plateau ecoregions. As such, the area is home to a large diversity of species and landscapes including iconic species such as the endangered golden-cheeked warbler and Barton Springs salamander. Mean daily low and high temperatures in April are 60F and 80F. Field trips will highlight unique environments of Central Texas including local research facilities, the Lady Bird Johnson Wildflower Center and excursions into the Hill Country.